Biochar offers soil a highly porous, stable carbon structure that has potential to increase water retention, reduce nutrient leaching, increase microbial life, and ultimately, grow stronger, bigger, healthier plants. Biochar behaves in soil much like a coral reef does in the ocean—it provides a safe haven for life. The many pores in biochar act like a home for microorganisms, beneficial bacteria, and mycorrhizal fungi. All together, these tiny creatures bring your soil to life, just like a coral reef is the basis for so much life and vibrance in the ocean. Living soil is healthier and more resistant to disease. The carbon in Soil Reef™ Biochar absorbs water like a sponge, and adsorbs nutrients like a magnet, holding onto them and preventing them from leaching into groundwater. The symbiotic relationship between plant roots and these soil colonies help plants to access these nutrients. Thus, you get more bang for your fertilizer buck with Soil Reef. As always, we recommend using compost and natural fertilizers with your Biochar, for the health of you and your loved ones, and the planet. 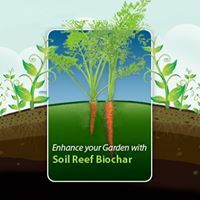 You can buy Soil Reef Biochar by visiting our store page or clicking the Order Now button.